James Grayson has become the latest Saints Academy graduate to commit his future to the club. The fly-half has put pen to paper on his first senior contract, meaning he will remain at Franklin's Gardens until at least 2021. Grayson follows in the footsteps of Ehren Painter, Lewis Ludlam and Fraser Dingwall, who have all agreed new contracts in recent weeks. The news is another big boost for Saints as they look to build a team around their talented crop of youngsters. And Grayson, who has featured in eight of Saints’ first-team matches so far this season, starting five, is relishing the prospect of representing the club for at least two more seasons. “Northampton is my home and Saints is the club I’ve supported all my life, so naturally I’m ecstatic to be signing,” said the 20-year-old. “The club have supported my development throughout my junior career and I’ve never imagined playing anywhere else. A former student at Northampton School for Boys and rugby captain at Moulton College, Grayson’s first club was Old Northamptonians. He moved through the age groups at ONs and earned international honours with England Under-17s and Under-18s, while being a member of Saints’ Junior Academy. Grayson excelled while wearing the Red Rose, with standout performances, including scoring 21 points in victory over Wales, helping England win the Under-18s Five Nations Festival in 2016. He continued that form into the Under-20s side, featuring in both the 2017 and 2018 Six Nations and World Rugby Under-20s Championships for England. Grayson also helped the Wanderers lift the Premiership Rugby A-League trophy twice in consecutive years, breaking into the first team midway through the 2017/18 season. 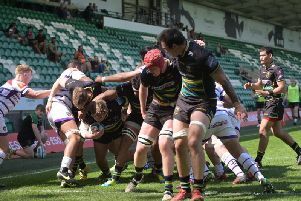 And he scored his first try in black, green and gold as Saints defeated Bristol Bears on home soil earlier this term. “James is a young player with heaps of talent and an excellent work ethic to make the most of his ability,” said Saints boss Chris Boyd.